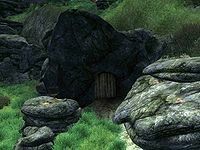 Bloodcrust Cavern is a small cave southeast of Skingrad containing vampires (quest-related). 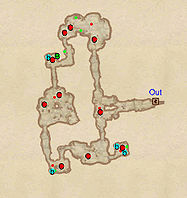 It contains only one zone, Bloodcrust Cavern. The Vampire Dust from the vampires in this cave during the related quest is not the same as regular Vampire Dust. They may look the same, but they won't stack. You can actually make a potion with all 4 effects by mixing one of each. This cave contains 7 Cairn Bolete plants. 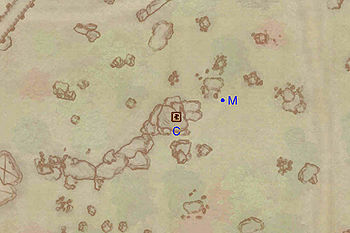 This location's map marker (M on map) is named Bloodcrust Cavern (editor name BloodCrustMapMarker). The entrance door is WSW of the marker, 60 feet away. 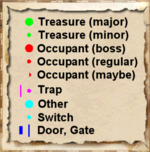 1 boss-level Chest (Vampire variety; locked) at location B on map, in a corner behind two barrels.